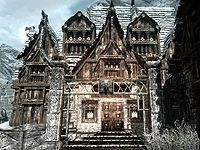 Hjerim is the house in Windhelm you can purchase. Located in the Valunstrad district, the name translated from the ancient Nordic language means "Home of Frost". The property once belonged to Friga Shatter-Shield, daughter of Tova Shatter-Shield, but it was abandoned after Friga was killed. Purchasing the house before completing Blood on the Ice will begin that quest as soon as the house is entered for the first time. Prior to purchasing any of the upgrades, Hjerim features little more than a wardrobe, poor quality double bed, and a chest. 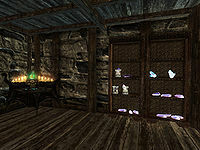 However the upgrades available for Hjerim include a large armory with many display cases, weapon and shield plaques, mannequins for displaying items, and a large amount of bookshelves. Hjerim also features a secret chamber hidden behind a false-backed wardrobe, which can be turned into an Alchemy and Enchanting room. It is also one of only two houses where purchasing the children's bedroom doesn't remove any of the other upgrades (the other is Proudspire Manor). Hjerim can be purchased having sided with either the Imperial Legion or Stormcloaks. Once allied with the Stormcloaks, the 'Battle For Fort Sungard' quest must be completed before Jorleif will make the house available for sale. 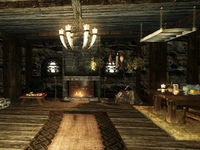 However, if Falkreath Hold has been given to the Stormcloaks as part of Season Unending, it may be necessary to liberate Hjaalmarch before Jorleif will make this house available. If the Imperial Legion is chosen as an ally, then the defeat of the Stormcloaks is required before it is available to buy. * This person only exists once you become Thane of Eastmarch. The manor is found in the far northwest corner of the city, next door to House of Clan Shatter-Shield and opposite House of Clan Cruel-Sea. Once you have completed the reputation quest for the Thieves Guild in Windhelm, in the yard, to the right of the entrance is a barrel marked with the Cache shadowmark. 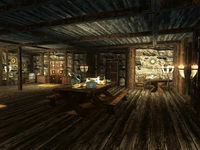 Prior to purchasing any upgrades, when entering the house you will find blood stains on the floor, a few bottles of Nord mead and various pieces of clutter scattered on the floor of the first floor. In an alcove to the south is an empty chest. To the west is a separate area with a doorway connecting it to the main room. In this area is a small unit where you find the pile of leaflets, a journal, and a strange amulet all relating to the related quest. There is also a normal tall wardrobe containing a selection of fine clothes and boots and the tall wardrobe with a false back giving access to the room where the butcher performs his disgusting rites in an effort to raise his sister who died several years ago. The room contains many skulls and bones scattered all across the floor and on the table, some of which are cleaned while others are still covered in gore and blood. Upstairs is mostly empty, with exception of the master bedroom, which contains a poor quality, large king-sized bed, coming out from the north wall, slightly away from the wall. There is a square wooden table and two chairs against the south wall. Against the east wall is a small wardrobe containing more fine clothes and boots. When purchasing upgrades, it's best to start with getting the house cleaned (see bugs). With each upgrade purchased, decorations will include several floor coverings and goat horn lights on stands, walls, chandeliers and shelves, etc. The exception is the hidden room that is now used for alchemy and enchanting as it gets neither additional light nor floor coverings. For details of what is included in each room see below. ‡Bones and blood stains will remain, regardless of upgrades, until this is purchased. Purchasing the living room upgrade beforehand will remove this option for purchase (see bugs). The house is cleaned throughout, removing all blood stains, and the chest that was against the south wall is removed (make sure you aren't storing anything in the chest before purchasing this upgrade). All the clutter, etc gets removed, while in the secret room, this is fully cleaned, the bones, skulls and even the table that Calixto Corrium's sister was laid out on. A set of shelves against the west wall is added. All the items in the master bedroom remain. This furnishes the room that is immediately on the right when entering the house. There is a fire pit in the northwestern corner, while in the middle of the north wall is a fireplace with a cooking pot hanging in front. To the left is an ornamental cauldron with a low table in front, and a rack of dog meat, two raw rabbit legs, four carrots, two sprigs of elves ear and three garlic bulbs all on top. To the right of the fireplace is a pile of firewood with a woodcutter's axe sticking out of it. Above the wood, hanging from three racks are two garlic braids, two bunches of dried elves ear, two bunches of dried frost mirriam, two rabbits and two pheasants. Against the east wall, to the right of the fireplace is a small square table and two chairs. The table holds fine crockery including jugs, plates, bowls, goblets, etc. There is a sweet roll, a salt pile, an eidar cheese wheel, a baked potato, two portions of grilled leeks contained in a bowl, a boiled creme treat, two loaves of bread, a goat cheese wedge, and two bottle of alto wine. Further to the right of the table set back in an alcove are two sets of shelves, they hold three bottle of alto wine, a bottle of wine, four bottles of Nord mead, two goblets, a gourd, a honey nut treat, two potions of regeneration, five random potions of lasting potency, and two random potions of extra magicka. Against the south wall are a pair of wall shelves, the lower shelf holds a pile of sacks, while the top shelf holds two salt piles and several wedges of cheese. On the far side of the doorway is a small, empty bookcase, beside this is another set of shelves which holds a raw venison haunch, an eidar cheese wheel and a sliced goat cheese. Against the west wall is a table that appears to be used for preparing the food. There is a bottle of alto wine, a bottle of wine, four bottles of Nord mead, a bowl containing a cabbage, an apple pie, a raw joint of beef, a tomato, a couple of pieces of cheese, several potatoes and a bowl overflowing with red and green apples. On the floor beside the fire pit is a cast iron pot containing five tomatoes. There is a wooden bench on the left as you enter the master bedroom. To the right is an alcove with a tall wardrobe in the corner containing fine clothes. To the right is a small square table and two chairs with fancy crockery on the table. In the other corner of this alcove is a wash basin. The large king-sized bed is now made with fine linens an have an end table on either side, it is still coming out from the north wall, and a foot or so away from the wall. 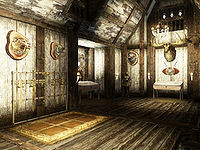 There is a shield plaque on the wall behind the bed holding twin crossed iron greatswords with an iron shield over them. In a small alcove on the east wall is a corner shelving unit holding an iron war axe, with a pile of food sacks underneath. There is a second small alcove further to the right containing a large round wooden table. On the table is a draught of vigor, a solution of enhanced stamina, a leather strip and flute. Between the two alcoves, against the east wall, is a small set of shelves behind it. The shelves hold a potion of extreme magicka, a potion of plentiful healing, a potion of vigorous healing and a potion of plentiful stamina, a drum and copies of A Children's Anuad and Feyfolken I. However the original small wardrobe may get left behind--(see bugs). To the right are a set of three wall shelves. Against the south wall is a tall bookcase with a tall set of shelves to the right. These hold a bottle of alto wine, a bottle of wine and two dagger display cases. To the right of the door as you enter is a small wardrobe with a food barrel in the corner beside this and a chair on the other side of the barrel. On the left as you enter is a matching small wardrobe, both of which hold fine clothes, this second wardrobe has a bottle of wine on top and a pile of food sacks beside it. To the right in an alcove is a set of shelves holding a solution of extra magicka, a bottle of Nord mead, a solution and a philter of health, a solution of regeneration, a flute and a bottle of alto wine. There is also a drum on the floor beside the shelves. 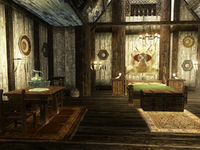 In the southeastern corner of the room is a large round wooden table and a chair, holding a bottle of alto wine, two bottles of Nord mead and a goblet. In the alcove that originally held the chest on the south wall, it now holds a set of shelves. On the shelves are three bottles of Nord mead, two goblets and a lute. Further to the right of this wall is a small unit holding a bottle of wine, with a large fancy vase and empty open crate beside it. There is a corner shelving unit is the southwest corner holding a bottle of alto wine. Beside the side of the stairs that leads up to the top floor are a set of shelves and a small empty bookcase. On the shelves are some pieces of charcoal, a woodcutter's axe—(see bugs), a bottle of alto wine and a bottle of wine. To the left of the doorway into the kitchen is a long wooden table that holds a solution and a philter of strength, a bottle of alto wine, two bottles of wine, a jug and a pile of food sacks, with more sacks under and in front of the table. In the middle of the room is a very long wooden table laid with fancy crockery and a bottle of alto wine, a bottle of wine, two bottles of Nord mead, a raw venison haunch, two carrots, a portion of scaly pholiota fungus, a salt pile, a baked potato, a portion of grilled leeks, a salmon steak, a cabbage, a goat cheese wedge, a loaf of bread, a honey nut treat and a charred skeever hide. Both the alchemy lab and the arcane enchanter are installed into the hidden room where Calixto Corrium performed his grisly experiments and rites, the alchemy lab is against the west wall in the southwest corner. To the right of this is a set of shelves holding various ingredients listed below and two bottles of frostbite venom. Against the north wall is a small empty bookcase. The arcane enchanter is in the northeast corner of the room, three weapon plaques are to the left, on the north wall and two tall sets of shelves are to the right, against the east wall. These hold two empty black soul gems, an empty common soul gem, two empty greater soul gems, four empty and four filled lesser soul gems, one empty and two filled petty soul gems. At the top of the stairs on the north wall is a set of shelves with two dagger display cases and a mannequin in the northwest corner. Against the west wall is a large display case as a weapon rack, above this on the wall is a shield plaque holding twin crossed iron greatswords with an iron shield over them. A second mannequin is in the southwest corner, while on the south wall in two alcoves are two more large display cases for displaying a weapon in each. Between the alcoves on the east wall are a row of five weapon racks. To the left of the second alcove is another mannequin in the corner with a small bookcase beside it. In the corridor outside the bedrooms are a total of four weapon plaques and two wall shelves, two on each side. The area where the wardrobe with the false back that opens into the hidden room, now containing the alchemy lab and arcane enchanter is converted into a small children's bedroom. There is a chest on the left as you enter with a practice dummy beside it. Against the south wall is a small wardrobe containing fine clothes with a set of shelves on top. These hold a flute, copies of Trials of St. Alessia, Kolb & the Dragon, Herbane's Bestiary: Ice Wraiths and A Children's Anuad, a bunch of jazbay grapes, a bunch of lavender and a satchel containing a few septims. There is a lute on the floor beside the wardrobe. Two children's beds come out from the west wall with a chair and end table between them. On the end table is a copy of Yellow Book of Riddles and some charcoal sticks. While above the left-hand bed is a wall shelf holding a sprig of elves ear, copies of Horker Attacks, Kolb & the Dragon and Ahzirr Traajijazeri, and two drums. "Well, love, very well. There's so much history in this city, so many things we can do here." 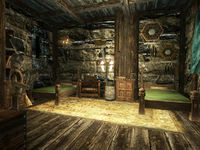 Once you become Thane of Eastmarch, entering the second bedroom upstairs, there is a square wooden table and chair in an alcove on the east wall laid for one with fancy crockery. A single bed is against the south wall in another alcove, while in a third alcove on the west wall is a tall wardrobe containing clothes. Against the north wall is a dresser also containing clothes and having a solution of strength and a philter of haggling on top. The list of upgrades in the house guidebook given to you by Jorleif after purchasing the house lists incorrect upgrades. Even before Hjerim has been purchased as your house, resting on the main bed will render you well-rested. With the added bonus of four safe storage containers, it can be used as a home before it has been purchased. Hjerim used to belong to the now deceased Friga Shatter-Shield - this can be confirmed during the quest Blood on the Ice, where you can ask Tova Shatter-Shield for the key to Hjerim, referring to it as "your daughter's house". The option to buy "Clean up the murderer's mess" may disappear if you purchase the Living Room upgrade first, but the "mess" will still be there. This seems to be a scripting error, as the living room option disables the cleaning option, which does not disable itself. It should reappear after the next purchase. This bug is fixed by version 1.4.15 of the Official Skyrim Patch. You can use the console command DF492.Disable to clean up the mess. It is possible that the chest near the master bed will not be present, even though it is listed as included. You can fix this issue by entering Hjerim, opening the console, and typing the following: prid 10FD82, press enter, then enable. This should make the chest appear. This can be caused during Blood on the Ice. If you confront Wuunferth directly instead of going to Jorleif with your suspicions, the chest will not appear when you buy the property later. Most daggers placed in the lower case cannot be retrieved (Dragon Priest style daggers have been reported to be removable). Daggers placed in the upper case are extremely difficult to retrieve (Daggers with unusual thicknesses, such as Keening, may be removable by facing the case from just the right angle). Multiple daggers can be placed in the same case. Opening the console and typing tcl can be used to retrieve the daggers. If the previous solution doesn't work: Open the console, click the dagger that is stuck in the case, enter getpos z, note the decimal number that is shown, enter setpos z N where N is the decimal number +10. For example, if getpos z prints 216.06, then you should enter setpos z 226.06. This command moves the dagger so it's floating above the case, where you can easily grab it. It works for the top and bottom cases. The option to buy the house may exist but you are unable to actually purchase it even after completing the prerequisites as the dialogue still says it is unable to be purchased due to unpleasantness. It is possible that after the Battle of Windhelm, Brunwulf Free-Winter may not appear in the Palace of the Kings, preventing you from being named Thane of Eastmarch and preventing the purchase of Hjerim. To fix this, use Unrelenting Force on the former Stormcloak-supporting Jarls ousted by the Imperials in the Palace of the Kings. This will give you a bounty in all of the Jarls' former holds. Fast-travel away from Windhelm and return; Brunwulf should be there. The master bed may still say "investigate bed and chairs" when you point at parts of it. Just move the pointer to another part of the bed and the option to sleep on it will appear. The display case closest to the bedrooms can hold large weapons such as battleaxes or warhammers, but staves will disappear if placed on it. In the master bedroom, the small wardrobe may get left behind causing it and the set of shelves to occupy part of the same space against the east wall. This obscures the bottom shelf that holds a potion of vigorous healing and a potion of plentiful stamina making them inaccessible. The old bed as well as the old table and chairs may also still be there, in the same place as the new ones. This will not inhibit your use of them however. You may be unable to interact with the woodcutter's axe. This page was last modified on 11 December 2018, at 06:25.